Is your business data-driven and analytical? In this interview, Strategic Resources, Inc. principals Ben Hess and Dave Hess explore the key ideas and best practices they’ve seen guide successful analytics efforts. Dave Hess: Data and analytics is a red hot topic – it seems to be everywhere these days. I’m seeing more businesses think about how to create an analytics capability, building on the growing prevalence of data and new tools that are now out there. Tell us about the conversations you’re having with business owners and managers on this topic. Ben Hess: Well, you’re exactly right. About half of my most recent meetings have focused in some way on the topic of data analytics. What I’m seeing is small and middle market business leaders finally embracing the criticality of being data driven and analytical in managing a business. They’ve moved beyond mere recognition of the idea, and are starting to take action. Many of those actions come with inherent issues and challenges, but the trend is in motion. Dave Hess: As we work with companies to implement analytics efforts, we spend a good deal of time getting them focused on the business purpose of such efforts. What are some of the key issues you’re seeing as businesses attempt to go from concept to reality in leveraging analytics? Ben Hess: I think the biggest issue we see quite often is data analytics efforts being led by IT, not by the business. Instead of focusing on business problems or opportunities, IT-led efforts often start with perfecting data management or upgrading software. A lot of time, effort, and money gets spent without a commensurate ROI. The business doesn’t see anything getting done, so the term “analytics” becomes a stale or dirty word, which prevents any sort of value creation. Dave Hess: We’ve seen some of the most successful companies drive a high level of engagement with their people through analytics efforts. Can you briefly describe what’s worked well for those companies? Ben Hess: The first thing is to have a business-first approach. Data analytics should focus on getting the right information, asking and answering the right questions, or making the right decisions. 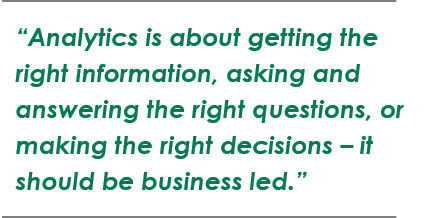 Clearly articulating the business purpose behind analytics is critical for engagement. A second key element is for an analytics effort to have a sponsor who resides in the business. The most successful analytics efforts we’ve seen have been sponsored by an owner / president, or a functional lead like the CFO or Head of Sales. It’s important from the start that the organization not just see the effort as related to technology, but instead sees it being driven by creating value for the business. That’s important. The third key to success is to break from the status quo and just get started. With something. Somewhere in the organization. Analytics efforts typically require a degree of trial and error as an evolution that is both about the numbers but also about changing the way people think in an organization. It might not be perfect from the start, but it needs to start somewhere, and even iterative efforts can yield significant gains. Too many businesses fail to take even the first step. Dave Hess: A focus we’ve always had with business leaders is to identify the key drivers of their business model. How can analytics help take that to the next level? Ben Hess: In our experience, a very good starting point for small and middle market businesses is with data visualization. Visualization is a special flavor of analytics, focused on presenting data and information in a way that is visually appealing and engaging to people. Individuals process visuals 60,000 times faster than text. We’ve seen a lot of opportunity to get people out of dizzyingly complex Excel spreadsheets or Pivot tables and into pictures and images that they respond to much better. There are a lot of practical tools and methods to help businesses with visualization, and they are cost effective and cheaper than hiring full time talent. The tools can be used to work with existing data and information, building dynamic and customized views of a business. What we’ve been working on most with companies is combining principles of visualization with a business-first approach to help build a data-driven culture. Dave Hess: We are seeing a trend in business owners being more interested in data analytics and engaging with management to deliver value with the visualization capability you just described. What have you seen as the benefits of such efforts? Ben Hess: The value from becoming more data driven and analytical is real, in both financial and non-financial terms. Any number of recent studies have quantified this fact. A recent article by McKinsey outlined financial benefits in the form of 5% higher return on sales, sales growth of up to 10%, and margin uplift of 1 – 2% (1). Additionally, there are non-financial benefits. Take visualization, for example. A recent study by the Aberdeen group looked at companies using visualization and saw a 38% higher likelihood of developing in-house analytical talent alongside increased knowledge sharing and collaboration (2). Dave Hess: Our experience is that data-driven businesses can more clearly identify and realize value. For owners or managers looking to similarly deliver improved performance with the help of analytics, what are the most logical next steps? Ben Hess: I’d recommend a few initial steps. First, I’d demo visualization tools. We find that many companies don’t have an awareness of what visualization is, let alone how to apply it to their business. Seeing it – and I mean that literally – is important and starts to illustrate the art of the possible. Second, take inventory of the data and analytics-related needs in your business. Talk to finance, sales, marketing, operations and ask them where analytics can make their day-to-day easier, faster, or better. Inventory that list, prioritize it, and use that as a starting point for a business-led approach.